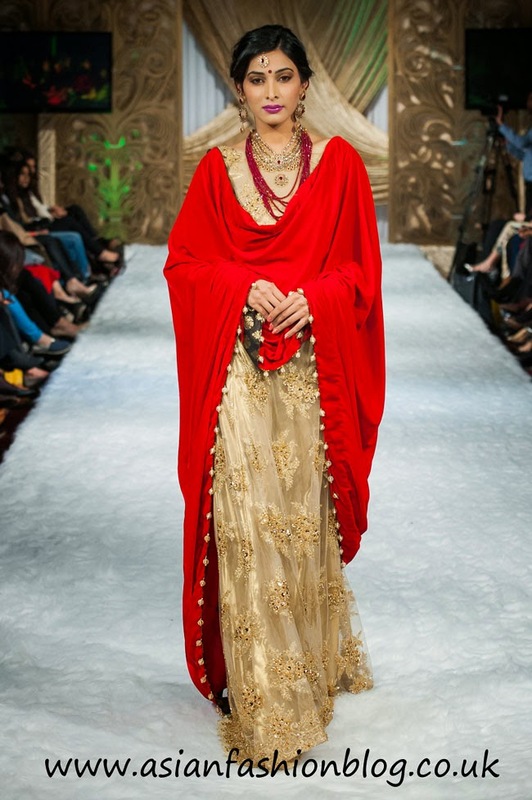 Pakistan Fashion Week 7, or PFW7, took place at the Russell Hotel in London on the 10th and 11th January 2015. 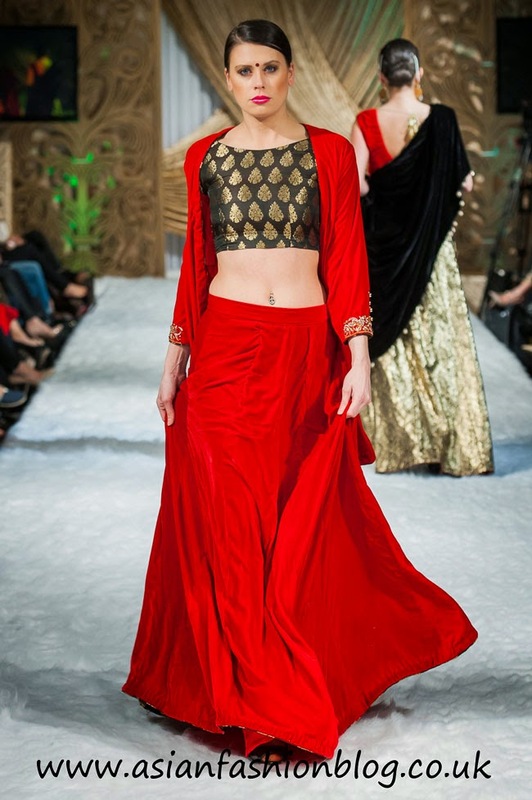 Photos from the show arrived in my inbox this week (a huge thanks to photographer Shahid Malik), and this collection by Faika Karim was one of the standouts for me! If you read my last post, about crop tops and lenghas, you'll instantly see the appeal of this collection! 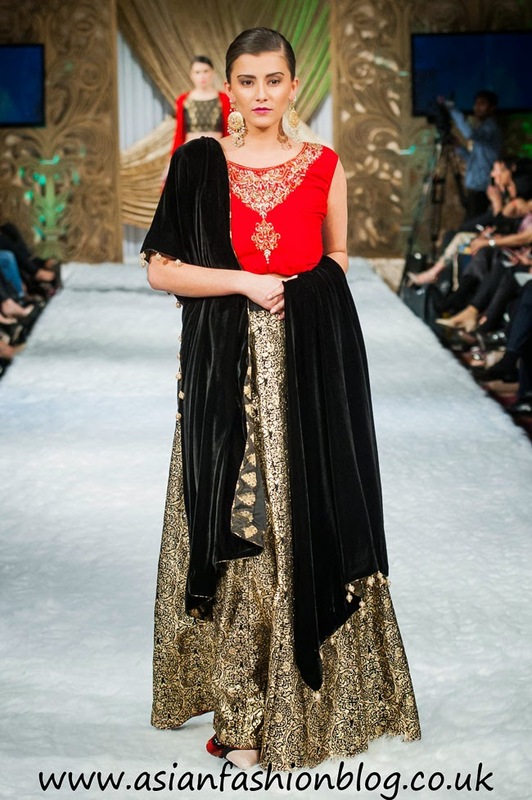 Entitled "Lahore", the colour palette for this collection was red, black and gold and there was a very sultry feel to the styling of the outfits at this show. 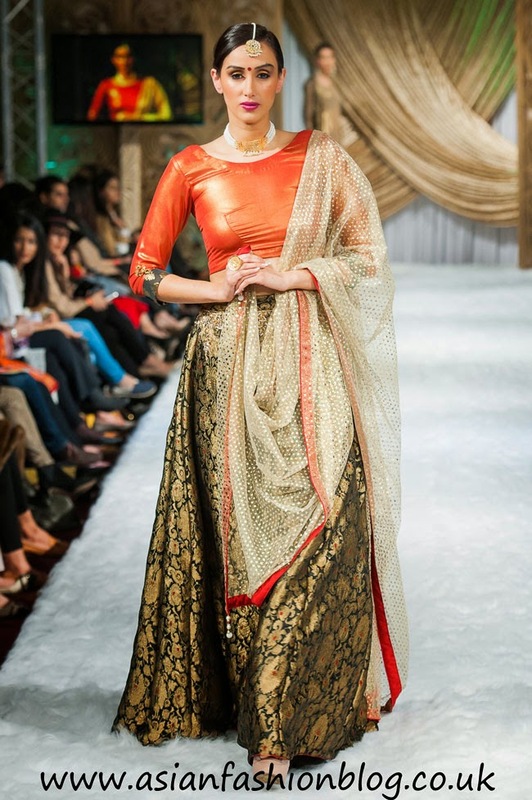 The gold lenghas in a variety of different metallic designs were my favourite pieces, although I didn't like the fit on some of the blouses, and in the outfit below (and a few others) the velvet dupatta draping style covers up most of the outfit! This was another blouse which I wasn't too sure about the fit of, I don't know what fabric this is made of, and maybe it wasn't a good fit for the model, but to me it doesn't look very appealing. 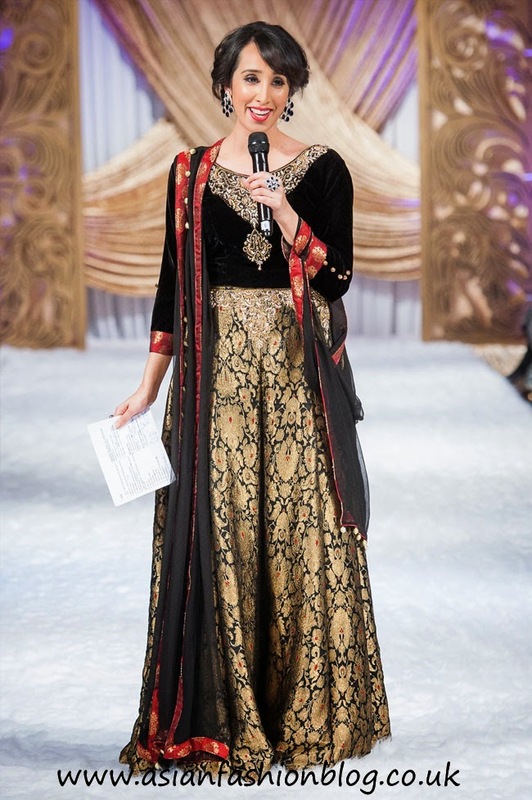 This was the final outfit, again, I would have liked to see more of the front of the dress - I assume it's a dress, could be a lengha, but can't tell! 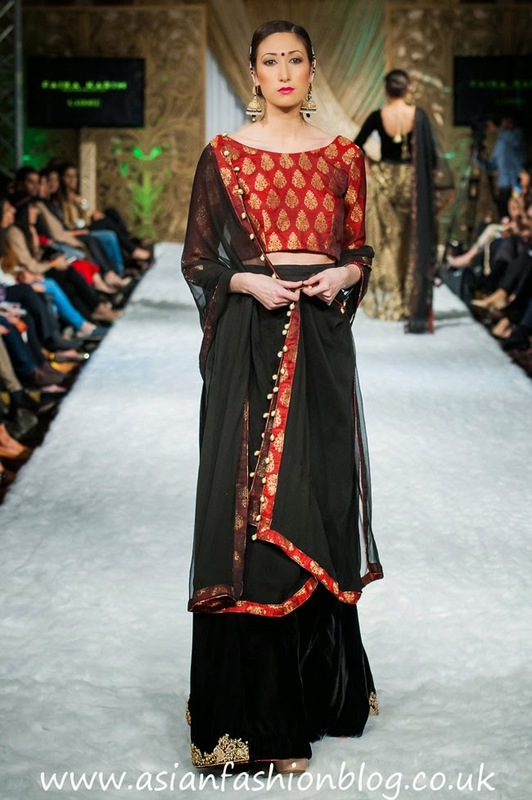 She mixed and matched the top and lengha from two of the catwalk ensembles and I must say I like her "softer" styling compared to the sultry look on the models. 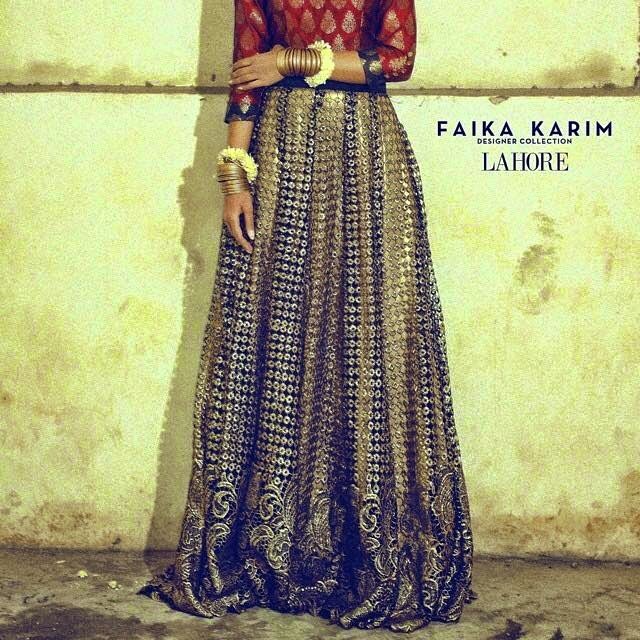 For anyone interested in seeing this collection in person, Faika Karim have a store in Bradford. Check out the Faika Karim Facebook page for more info! Make up: Saima Kiran and Team.